If you want to sum up the current state of the real estate market (especially in markets such as Phoenix and Miami), you could use just a couple of words. Like anything else, an asset is only worth what someone else is willing to pay for it. You may think that your beautiful two bedroom condo with a view in Miami is worth $700,000 - however, if someone is only willing to pay $500,000 for it, then that's what it is worth. If you own a condo in certain cities in the United States (Miami, Phoenix, Atlanta, Las Vegas to name a few), then you know all too well about the current weakness plaguing the markets in those towns. As mentioned, the problem is one of supply and demand: during the height of the housing boom, ground was broken on many new projects in those cities, and now a great number of condominium projects in those cities are sitting half-empty. In some cases, the projects themselves are half-done, as developers have run out of money to fund the projects. The reason? Banks not willing to lend anymore money to see the projects through to completion. In many cases, prospective buyers have put down sizable down payments to purchase a new unit in the buildings. However, real estate values have plunged, and investors are simply walking away from their deposits rather than buying into a condo that has already lost 20% of its value. Those who do end up fulfilling their obligations to buy the condo are either immediately selling at a loss or suing, citing some kind of a defect in the condo in an attempt to get their money back. It is quite conceivable that somebody who has put down a 5% deposit on a $500,000 condo will simply walk away, preferring to lose the $25,000 down payment instead of buying a condo that is now valued at $350,000. Do the math; it's not hard to see why they would do this. The upshot? Plunging prices in the condominium market as many people choose to walk away from their condo buys. Many banks have much too much commercial loan debt on their books right now so they are refusing to lend more money, and developers are canceling projects in various stages of completion, hoping for an eventual upturn in the market so that they can keep going. That's the bad news. What's the good news? 1. Supply, while still high, will eventually fall fast as new condo projects slow to a trickle. Right now supply far outweighs demand. Once this excess inventory gets moved (at lower prices), the markets in this cities can start to improve once supply drops and demand picks up. 2. A bottom, in terms of pricing, is within sight. Right now the market is all doom and gloom. Prices are dropping on an almost monthly basis, and no one seems willing to buy. The market acts in a herd mentality - sometime soon you will start reading and hearing about the bottom in the real estate market. Suddenly, everyone will want to buy again. Vulture investors (those seeking deals from distressed sellers), are already starting to circle, seeking great deals. The bottom is coming, probably sooner than you think. 3. More supply for renters. With many developers looking at high-empty, finished condo projects, they are needing to realize some sort of revenue from the properties. One option - transforming the condos into apartments which allow them to be rented out. If you are a renter, this will allow you to live in a beautiful new home for a reasonable price. 4. 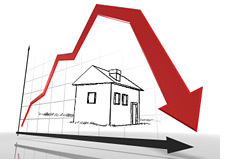 The real estate market should be much more stable in the future. If you can survive this downtown then the situation going forward will be much brighter. The real estate market has been largely out of control over the past decade. Banks will tighten their lending standards and people will (hopefully) be a bit more reasonable with their purchases. This will make your investment a bit more stable going forward. 5. If you are a buyer, you will get a great deal. With distressed sellers (banks, developers and regular sellers) littering the landscape, you are going to get an amazing deal if you are in the market for a condo in any of the aforementioned cities. That condo that you might have paid $500k for two years ago might now only cost you $300k. There is a dark cloud over these markets now, but eventually they will resume their uptick in terms of value. You could stand to do very well if you are a strong negotiator and get yourself a good deal. If you are currently stuck in an investment in any of these towns that I mentioned then it it probably hard to see much of a silver lining in this scenario. The bottom line is that the bottom is coming in these markets, and probably coming sooner than you think.